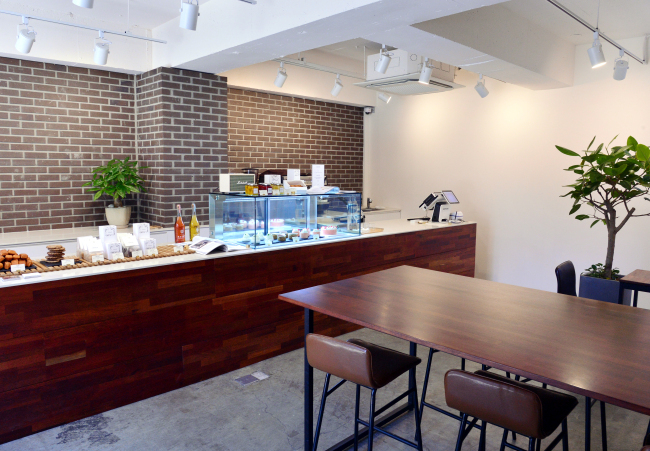 Before opening his own patisserie in a residential nook of Seoul’s Daechi-dong, Cedrat owner and pastry chef Choi Kyu-sung had already amassed over a decade of experience in pastry making. It began when he enrolled at the Institut National de la Boulangerie Patisserie in France to study pastries and bread making. He then stayed in France for over 10 years, honing his skills before returning to Korea to work as head chef at two cafes. It was only after that when Choi felt the time had come to strike out on his own. He launched Cedrat this October. Cedrat is a small patisserie with just eight seats. Sporting warm wood and brick accents along with floor-length windows, the space is bright and inviting, and if one arrives at the right moment, one will be greeted by the nutty aroma of butter being baked into some rich, delicious viennoiseries. “With viennoiseries, the fragrance of butter is key,” Choi, 33, said. 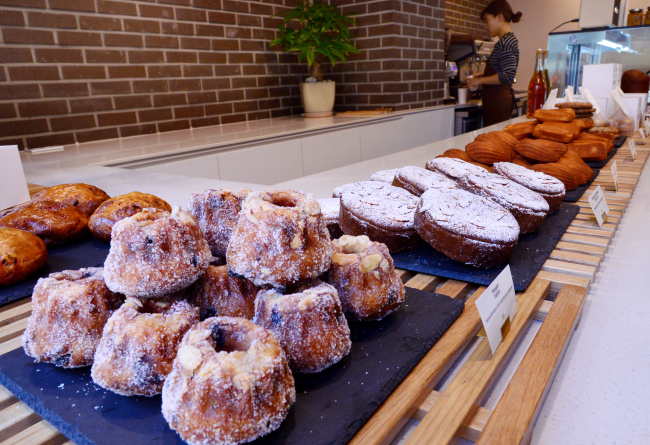 Choi said when he opened Cedrat he wanted to focus on viennoiseries, what are essentially sweet breads and pastries. There are plenty of viennoiseries at Cedrat, beautifully arranged in enticing rows, from lofty cylinders of brioche mousseline, the color of burnished gold, to plump, shell-shaped madeleines and hefty brick-shaped financiers -- small almond cakes -- ready to be munched on, one aromatic bite at a time. There is also the scrumptious bostock, which is believed to hail from Normandy. The bostock at Cedrat is crafted from thick slices of brioche mousseline -- which Choi makes with flour, eggs and butter. That soft, delicate bread is then sliced, soaked in orange blossom syrup and coated with frangipane -- an almond cream -- before being baked into a sweet, crisp, fluffy marvel. Just a plate of that and a cup of coffee would suffice, but there are many other delectable morsels that merit a try as well, including Cedrat’s financiers. These dainty cakes derive their addictive nutty flavor from brown butter. 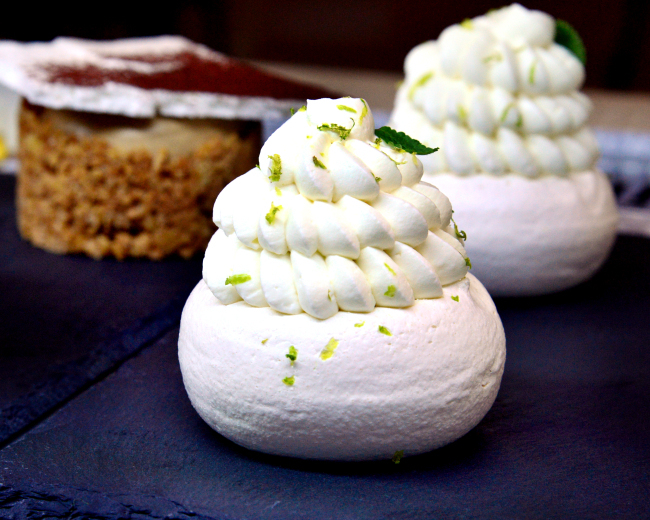 “Beurre noisette is what identifies a financier,” Choi said. Almond flour also seems to play a role in the nuttiness of this toothsome treat, which sports an almost caramelized-like exterior and slightly saline, rich crumb. In addition to viennoiseries there are also cookies at Cedrat, including little bags of decadent chocolate sable cookies. These cookies taste almost like fudge, shot through with luscious chocolate, pops of salt and intense hits of butter. Mon Cafe really stays true to its name, a layer of bittersweet coffee ganache and coffee Chantilly cream encased in a cylindrical shell crafted from crushed sable cookies that have been fused together with cacao butter and milk chocolate. Choi has also prepared a series of limited edition treats for the holiday season, including an opera cake. “As I settle in, I will expand my repertoire,” Choi said.